and also perfect for gift giving. Crunchy, sweet and full of toasty warm cinnamon & spice. 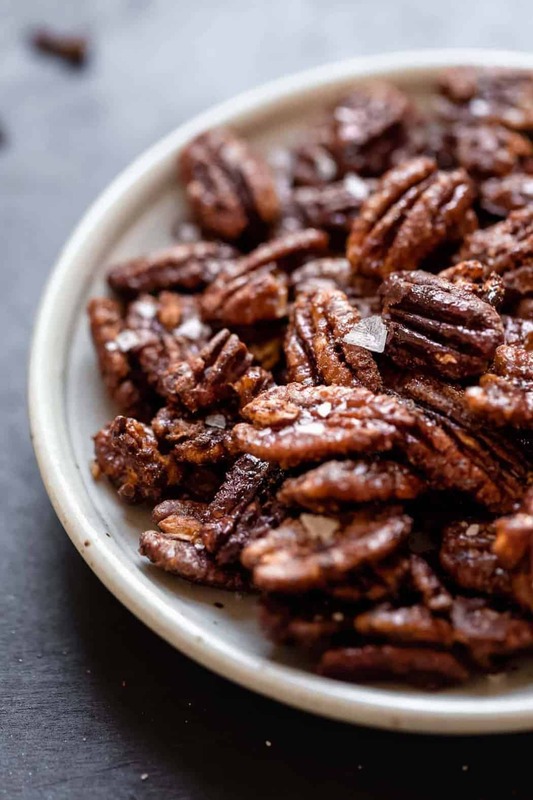 Holiday Spiced Pecans are roasted to absolute perfection. They’re infused with maple syrup and a nice blend of spices. You can enjoy them as is, add them to a mixed greens salad such as our Pomegranate Mixed Green Salad, top them on our Maple Mashed Sweet Potatoes, share them at your holiday gatherings or package them in mason jars for a special and simple holiday gift. 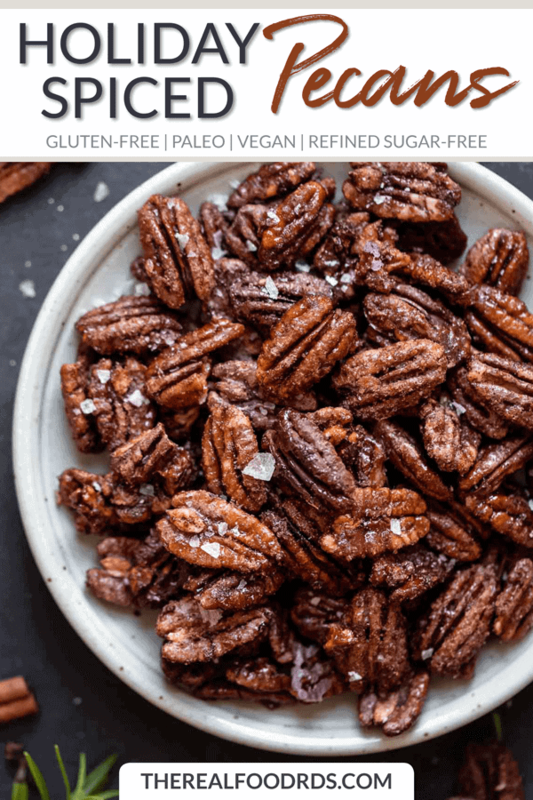 They’re easy to make, dairy-free, gluten-free, vegan and paleo-friendly, and made with no added refined sugar. This is a recipe that you and your family will love and one that you’ll most likely continue to make year after year. 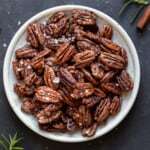 Holiday Spiced Pecans in the works! There really isn’t much to this recipe. Just toss all the ingredients together and let ’em roast. If you happen to be missing a certain spice in your kitchen, no worries and no need for a special trip to the grocery store. Simply use what you have on hand. For example, use a blend of cinnamon and nutmeg or cinnamon and pumpkin pie spice also works wonderfully in this recipe. Double the recipe – trust us, they won’t last long! Go ahead and double this recipe! To add variety, you can mix it up by adding 1½ cups of raw cashews and 1½ cups of raw almonds or any of your favorite nuts (walnuts, brazil nuts, macadamia nuts etc.). Make gift giving simple and delicious this holiday season! 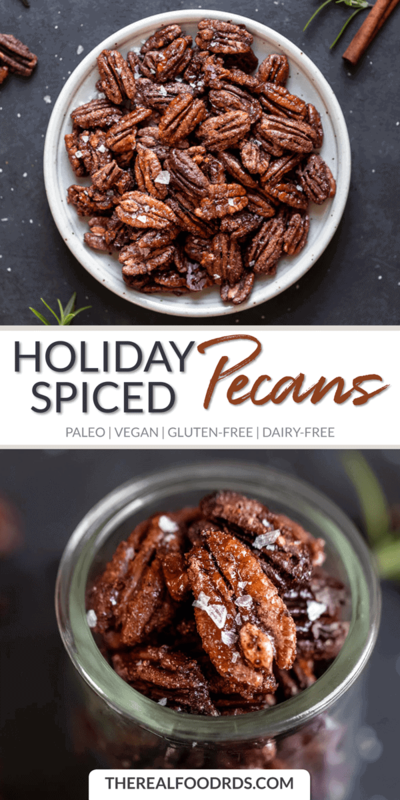 Holiday Spiced Pecans are one of my go-to’s when it comes to gift giving. Simply package them in a small mason jar, wrap the jar with pretty holiday ribbon, include a small card with the recipe and let your friends and family enjoy the heck out of them. Sometimes the best gifts come right from your very own kitchen! 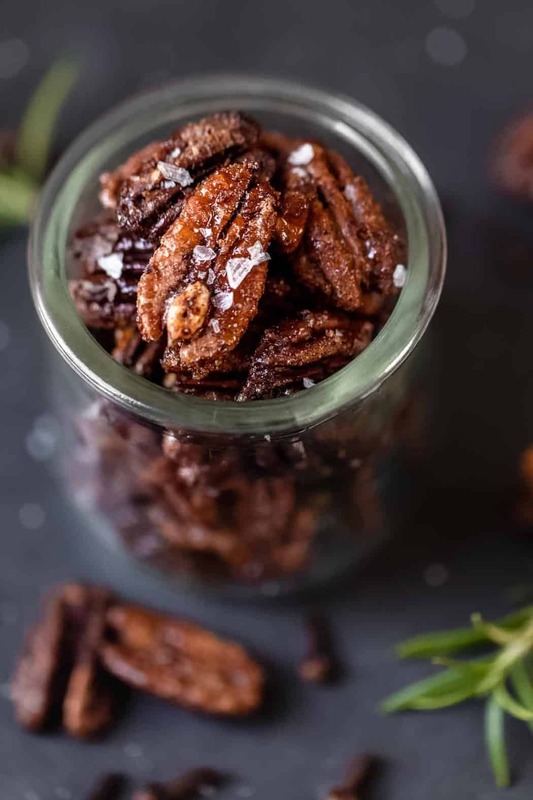 For additional holiday food gift ideas, we recommend our Slow Cooker Spiced Pecans, Chili Rosemary Roasted Mixed Nuts and 3-Ingredient Dark Chocolate Mint Cups. 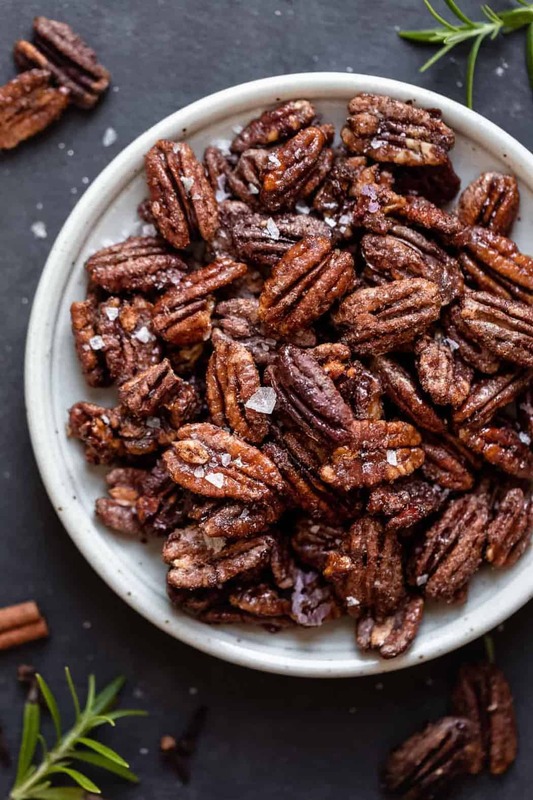 Holiday Spiced Pecans are roasted to perfection and infused with a blend of spices. Eat them as is, add them to a salad or package them in a mason jar for a special holiday gift. 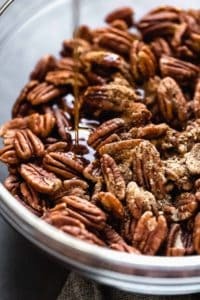 Place pecans in large bowl and mix in maple syrup until coated. Add spices and mix well. 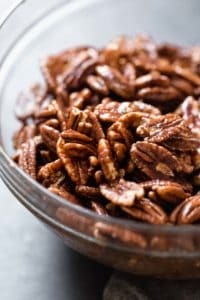 Spread pecans evenly on to the parchment paper. Bake 10-15 minute, stirring nuts every 5 minutes, until toasted and most of liquid has been absorbed. Cool until able to handle. 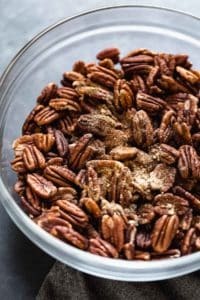 Break apart pecans as some may stick together. After completely cooled, store in airtight container. What are your favorite holiday food gifts? Granola, spiced nuts, cooking mixes, etc. We’d love to hear! These look delicious. The picture looks like they have salt on them. Did you add the salt after they came out of the oven? Hi there! Yes you can definitely sprinkle them with a little course sea salt for a little sweet and salt combo. Totally optional though! You could, they won’t be as crunchy if made in the slow cooker.